In the heart of this major French wine region, the vineyards of Anjou and Saumur are the largest of the Loire Valley. With 49,000 acres and 32 AOCs, this region is the refl ection of a rich palette: dry or sweet whites and rosés, red wines of character and fine sparkling wines. A green and golden triangle, drawn from Montsoreau to the Puy-Notre-Dame and to Saumur, encloses not only some of the best views in the region but also some of the best tastes. This land of vineyards has its celebrities: Saumur-Champigny, the sweet Coteaux de Saumur, and the sparkling Saumur Brut and Crémant de Loire. The limestone subsoil gives Saumur wine their unique characteristics. Different varieties, mainly Chenin and Cabernet Franc, produce a wide range of whites, rosés and reds. Different Saumur AOCs offer a range from dry to very sweet, still and sparkling, multiple aromas and fl avours. AOCs to enjoy: Cabernet d’Anjou and Rosé d’Anjou, Rosé de Loire and Cabernet de Saumur, Saumur Rouge, Saumur Champigny, Saumur Puy-Notre-Dame, Saumur Blanc, Coteaux de Saumur, Coteaux du Layon, Saumur Brut and Crémant de Loire. step before exploring the vineyards and the prestigious wine companies of Anjou-Saumur. A pioneer for the Loire fi ne sparkling wines, Jean-Baptiste Ackerman founded in 1811 his famous company in spectacular cellars dug in tufa limestone. He started the development in the area of Saumur Brut and Crémant de Loire in the traditional way. Embark for a “Journey to the Centre of the Bubble”, a unique scenography, and let yourself be carried away by the magic of art in the caves. The Ackerman Company has joined its know-how with fontevraud-la Scène to select artists whose ephemeral works of art brighten the space. A tour punctuated by videos, entertainment and games for the whole family. Tasting of the iconic wines of the Company. Including: meeting and reception rooms. Etienne Bouvet created the Bouvet-Ladubay company in 1851, thus associating his wife’s name with his brand name. Within a few years, the fine sparkling wines of Bouvet-Ladubay, Saumur Brut and Crémant de Loire, were exported worldwide. An expertise recognized by the granting of more than 460 medals in 40 years. Along the 5 km of galleries, visitors will discover all the stages of winemaking with, in the heart of the cellars, more than 1,000 oak barrels and a sunken cathedral (made up of 35 monumental sculptures). Including: Contemporary Art Center, nineteenth century theatre, wine-tasting school, seminar rooms. With its majestic position overlooking the Loire, harmoniously perched on the hillside, the site of Gratien & Meyer seems poised between heaven and earth. The Art Deco architecture of the building is as stunning as the unique view over the area. The visit gives access to vast tunnels dug into the tuffeau during the Middle Ages, where 5 million bottles are ageing. A scenographic journey illustrates a century of work founded in tradition and expertise. The visit details the winemaking process of sparkling and still wines from the harvest to the tasting. Note: seminar and receptions rooms available. Since 1885 the house of Langlois-Chateau has retained its family atmosphere and is a remarkable wine site. The vines overlook the cellars, which are dug into the tuff eau. The site off ers “Behind the Scenes at the Winery”, a presentation in 4 acts: 1 - Introduction to oenology in the wine school. 2 - Visit of cellars with wine presses and fermenting tanks for white and red wines. 3 - Visit of 300 meters of underground cellars, to understand the diff erent stages of the traditional method. 4 – Commentated, comparative tasting of still and sparkling wines. Visitors are always delighted to explore this former tuff eau quarry, in the town of Saumur where more than 3 million bottles are maturing. The visit explains how, generation after generation, the tradition has been perpetuated. This is the last, family wine house in Saumur and has become a great name in Saumur Brut. The guide introduces wine tasting of the traditional method wines, developed on the site: Saumur Brut, Saumur Rosé, Crémant de Loire, Rouge Mousseux etc. A selection of other Loire wines is also presented. In a separate area: an exhibition of the winemaker’s craft. Welcome to a world of elegance and tradition… In 1884, Elisa Amiot, the widow of Armand Amiot, decided to found her sparkling wine company in Saint-Hilaire-Saint-Florent. A woman of character, she set herself a challenge to meet her own expectations: develop and sell a prestigious Saumur wine known worldwide for its quality. The guided tour of the cellars dug in tufa limestone and of the modernized production site in operation (Monday to Thursday) allows the visitor to follow all the development process according to the traditional method. The commented tasting of wines from the company comes with valuable tips on combinations of food and wine. The cellar was founded in 1956 under the leadership of forty growers and the first collective winemaking took place in the autumn of the same year. The cooperative covers 10 km of tunnels, dug into the heart of the vineyard and today it tells a unique story of audacious human enterprise. The guided visit takes in the great, 12th century, vaulted cellar and the deepest, bottling chamber in Europe. 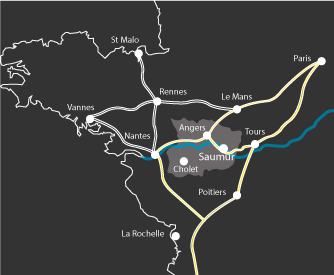 All the appellation wines of Saumur are available for tasting: Saumur Blanc, Rouge, Rosé, Saumur-Champigny, Saumur Brut and Crémant de Loire. This troglodytic site showcases the different Loire Valley appellations, through a series of 10 oenological steps. Selected wines (tasting and sales) combine quality and respect for the terroir. Vanessa Godfrin traces the history of terroir, grape varieties and other technical aspects of the wine world. Take a day or a morning to explore, share and learn about wine. The oldest distillery in the Loire Valley still in activity. It was here, in 1834 where the Triple Sec, “The Original Combier orange liqueur” was developed. The visit takes you through the room housing the magnifi cent, 19th century, stills which were made by the engineers of the Eiffel company. Today the distillery produces a wide range of liqueurs and syrups. Tasting at the end of the visit is an opportunity to enjoy the fruit crèmes and alcohol-free syrups, as well as the famous varieties of absinthe. Production also of the ‘Guignolet d’Anjou’, a regional specialty created in the Saumur distillery.